The first action item on day 2 of our trip was to attend our friend’s wedding, the next plan was to complete the local sight-seeing in Warangal city and head back though all of us had a tiny, niggling feeling about the Laknavaram lake disappointment. We got ready for the wedding, had a nice cup of coffee and stepped out of the hotel to go to the wedding. Geetha Bhavan is a decent enough hotel to stay but it has no proper parking place, one has to drive into a stinking, narrow corner near the hotel and park the cars under a make-shift shed. We parked there the previous night and by the time we were ready to leave for the wedding in the morning, a couple of other cars belonging to the hotel guests had been parked blocking the exit of our cars. Nobody knew in which rooms those guests stayed ! We dumped the idea of taking the cars out and took auto rickshaws – 3 autos to ferry 13 people ! We reached the wedding hall, greeted the couple and went straight to the breakfast area for a Warangal style breakfast and tea. In the meantime, two other ladies of our team joined us from Hyderabad, reaching Warangal by the morning train. We chatted on, while the wedding ceremony moved at its own pace. Having nothing else to do because the wedding feast was still 2-3 hours away, we were recounting the previous day’s travel when one of the guys suggested that since we had lot of time on hand we could start sight-seeing right away and if we completed that before lunch time, we still had a fair enough chance to re-visit Laknavaram Lake. All of us almost jumped at the idea. So, we got the mandatory group photo clicked, wished the couple and headed back to the hotel. It was 10.30 AM but hot and sultry already. We quickly freshened up and checked out of the hotel, thankfully the parking lot was free and we were back on the road by 11.30 AM to explore the ancient city of Warangal. At the risk of turning this into a History lesson, let us revise the history of Kakatiyas. They ruled the Deccan for more than 200 years between 1080 and 1300 AD, their capital city was called Ekasila Nagaram or Orugallu. The story behind the name says the entire city was carved out of a single massive boulder and hence the name Ekasila Nagaram or Orugallu or the One Rock City (this one makes it sound super cool, doesn’t it? ), Orugallu later became Warangal. Under the Kakatiya rulers, famous among them being Prataparudra, Ganapati Deva (after whom Ghanpur is named) and the legendary queen Rudrama Devi, the entire Deccan region was at the peak of prosperity, the Telugu language and literature made huge strides, through the works of great poets like Bammera Pothana who lived during this period and composed Andhra Maha Bhagavatham, art and architecture flourished as is evident even today through amazing temples like the Ramappa Temple. Hyderabad’s landmark Golconda Fort was originally built by the Kakatiyas. The Kohinoor diamond was unearthed during the Kakatiya rule, which was taken by the invading Delhi Sultans when the dynasty perished, the rest of the story of Kohinoor diamond, as they say, is history ! Kakatiya Dynasty is probably the only full-fledged Telugu dynasty in the history of Andhra Pradesh. 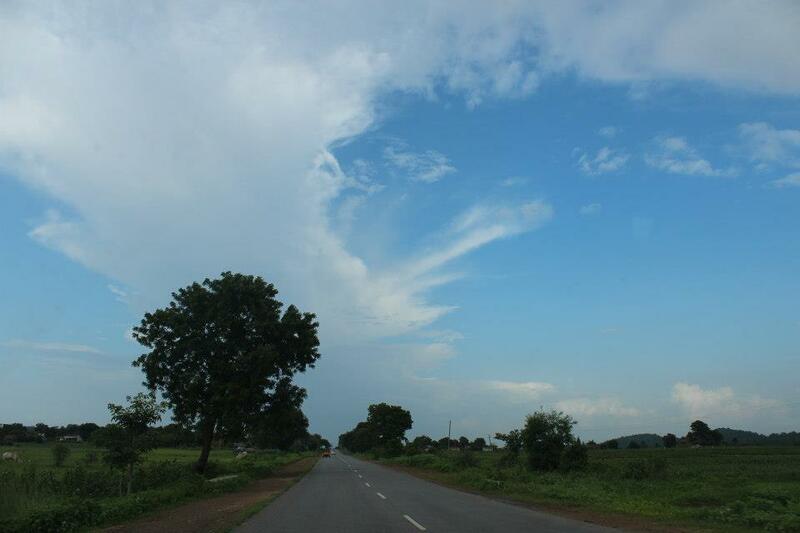 Today, Warangal is an important city on this side of the state after Hyderabad. 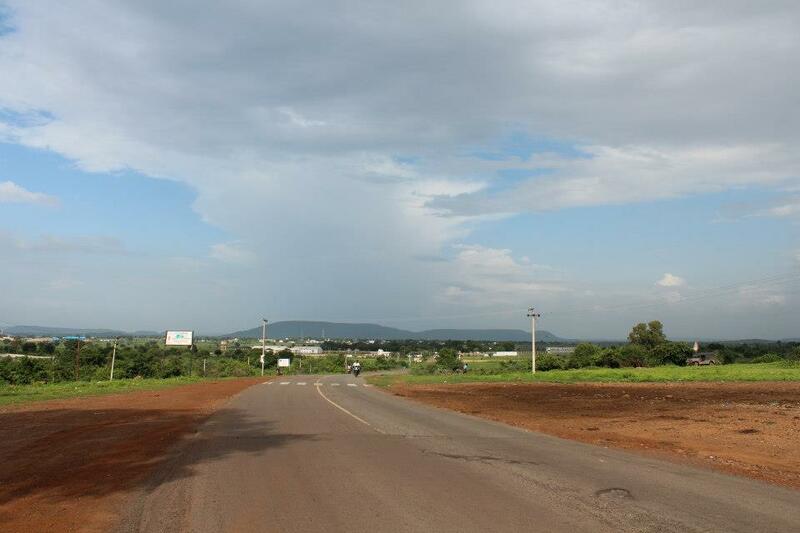 Warangal includes Hanamkonda and Kazipet, they are more like twin cities. Out of the three, Hanamkonda, 10 kms from Warangal is more metropolitan than Warangal and Kazipet and is the happening place. 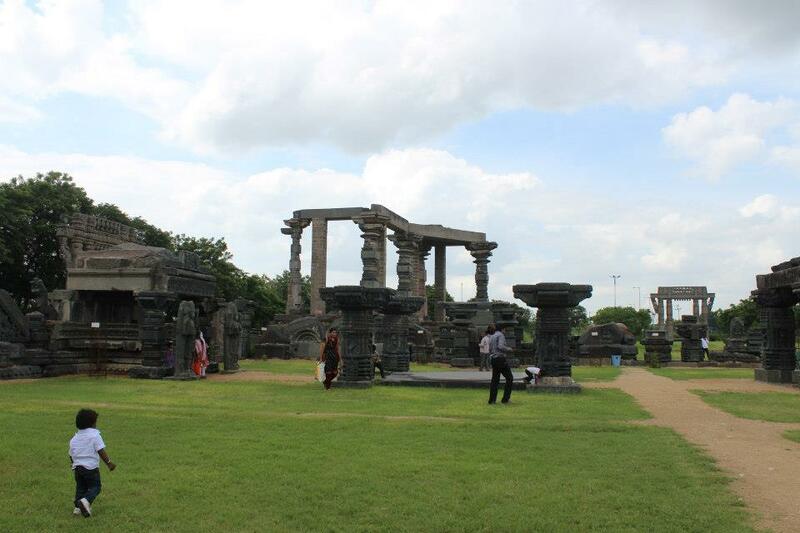 Warangal is more of the old city. Kazipet, goes without saying, is one of the busiest railway junctions in this region. Our first visit was to the 1000 pillar Temple or the “Veyyi Sthambala Gudi”. 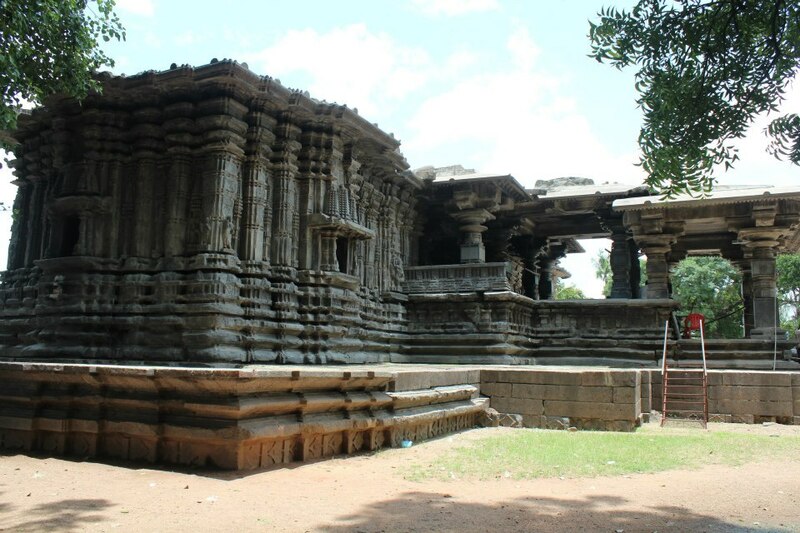 This 900 year old temple gets its name from a mandapa which has 1000 pillars. 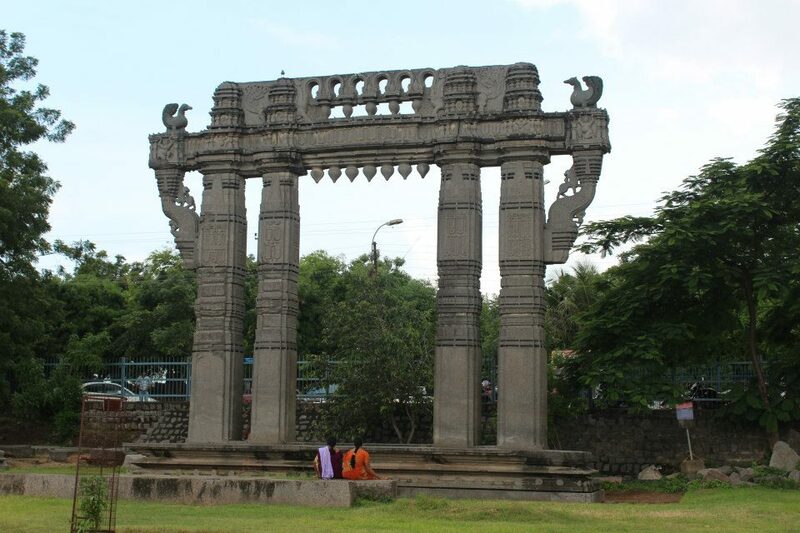 Any sane city would want to safe guard a heritage as rich as this, unfortunately, Warangal whose USP is its history doesn’t seem to give much thought to it. Today, the 1000 pillar Temple is shockingly located between two shabby looking modern buildings, in the middle of a busy market road, you pass by it 100 times a day but could still miss it because it is lost in the chaos around. How municipal authorities sanctioned construction of buildings around the temple is a billion dollar question? Is this what urbanisation is all about? Fuming at the pitiful state of the temple, we walked into the temple compound. The once proud icon of the Kakatiya Dynasty has today been reduced to a shy remnant, shy but silent beauty in black. 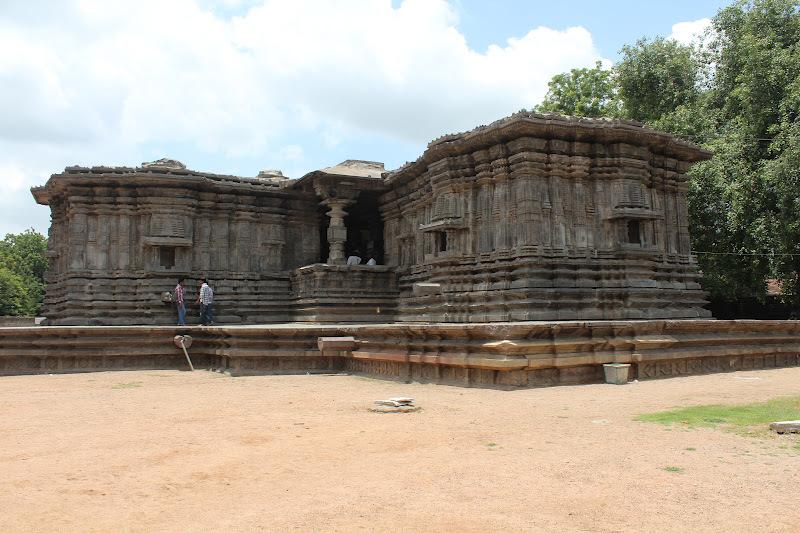 The temple has the standard Kakatiya architecture and was probably a precedent to the Ramappa Temple which was built a 100 years later. The temple has three shrines inside for Lord Shiva, Lord Vishnu and Surya. 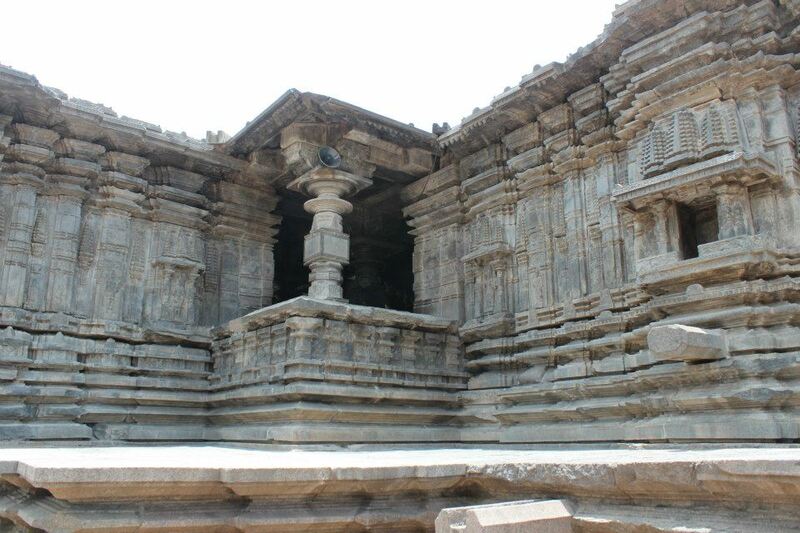 Unlike the Ramappa Temple, this is not heavily adorned with sculpture and has simpler designs. The stones used to build the temple have a worn out look. It has stood by itself 900 years, while madness grew around it, the tiredness shows ! 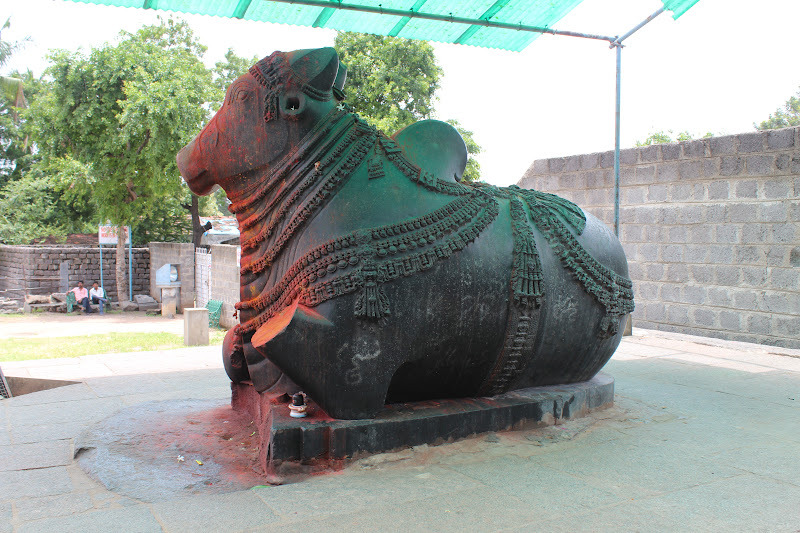 There is also the typical Kakatiya Nandi, it now rests with a broken limb. Save our heritage, please ! Somewhere around here, we realised something was amiss about the temple. The image of the temple we had from previous visits or pictures we had seen on the net didn’t match. The famed 1000 pillars were nowhere to be seen. They were not obviously in the main temple structure, so where did they disappear? The answer lay beyond the wall in the above picture, behind the Nandi. The 1000 pillar mandapa lies behind this wall, totally demolished, razed to the ground, except for the platform on which the 1000 pillars once stood ! It was a heart-breaking sight to see it lying wounded after having stood royally for centuries. For a History lover, the first thought would be to punch the ASI guys but on a positive note, it seems they have brought down the structure to give it a facelift and restore the crumbling mandapa. If this is true, then they could get a respite. During the visit, 7 years back, some of the 1000 pillars had collapsed and they had just begun the rebuilding process. A news article says the municipal authorities finally acquired the encroached land this year and have begun restoring it. If that is the fact, then we will have to bear with the necessary evil. The news article also quotes people who encroached this area complaining about the insufficient compensation, well, we take back our words, it is not the ASI but these people who need to be punched first, ASI and the municipal authorities cannot be absolved either, they deserve a punch too for letting people encroach these areas in the first place ! These restoration works take years together and what if they fail to restore it? Wouldn’t an architectural treasure be lost for ever? The wall has been built to prevent people from disturbing the restoration works because our people are experts in vandalism and graffiti. One has to feel sorry for these kings, they built these temples with so much passion and left them as heritage to people who do not know their value – what is that Telugu saying about jasmine garland in the hands of a monkey??? We waved a sad bye to the 1000 pillar Temple, wished it a speedy recovery and left the place. We stopped by for lunch and then decided to go to the Laknavaram Lake. Before that, we visited the Warangal Fort. 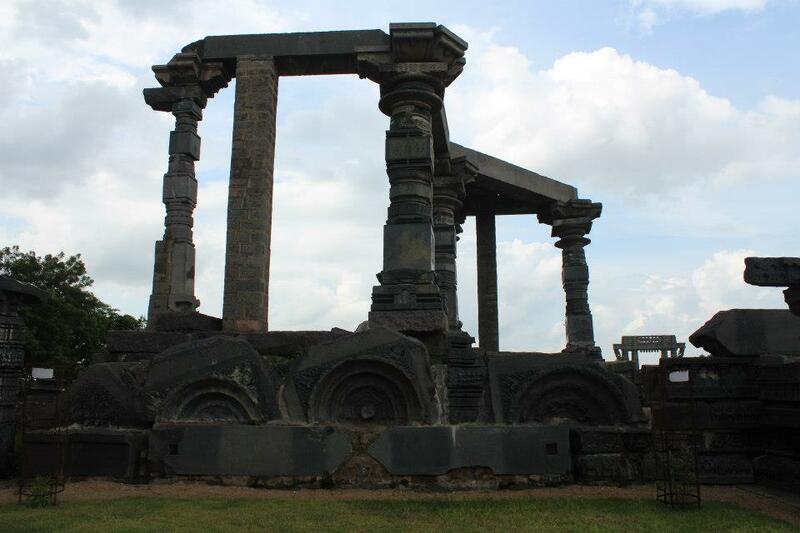 Warangal Fort is located in the old city. There is no fort structure as such, except for a few ruins that have been reassembled. 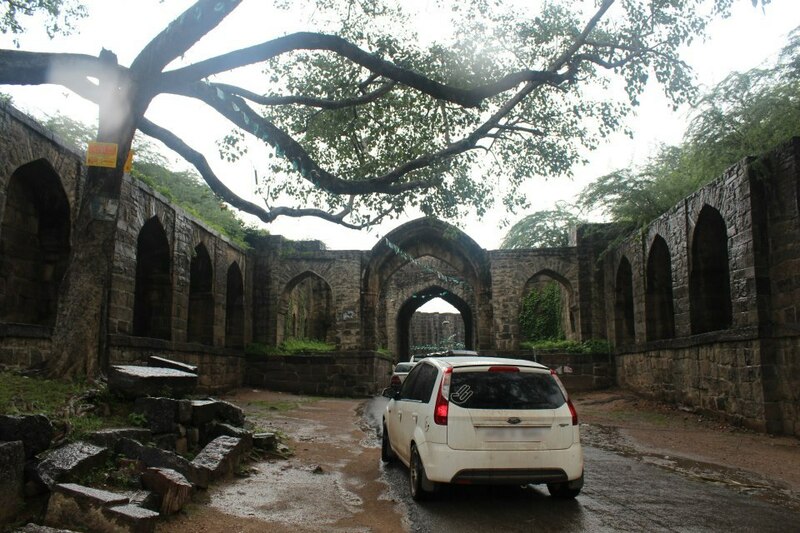 This is the Keerthi Thorana or the Gateway of Glory, there are 4 such arches around the fort, one in each direction. Anybody who has ever lived in Andhra Pradesh would know that this is the iconic monument associated with the state. 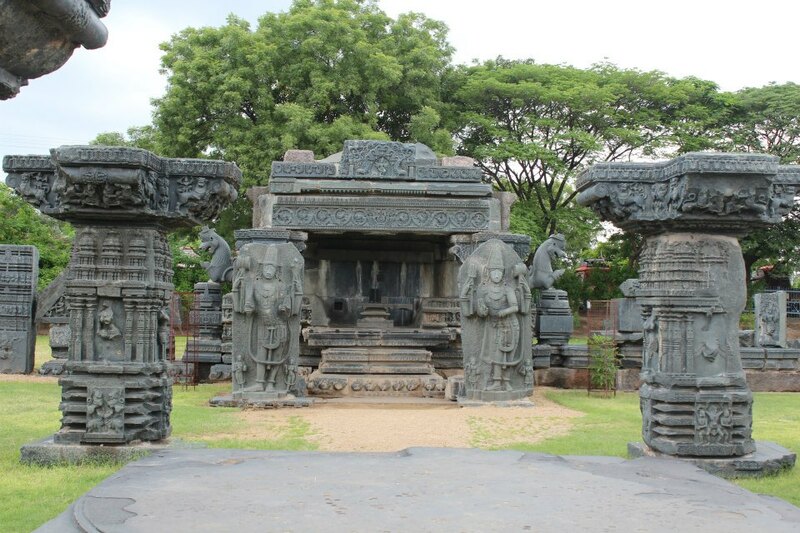 Another instance of the Kakatiya Nandi, just look at the consistency in design ! What is this massive chariot shaped structure? Imagine this fort in the days of its glory as kings, queens, noblemen and soldiers walked by this very place. Where once the royal horses galloped, the mechanical horse powered beasts drive through today ! 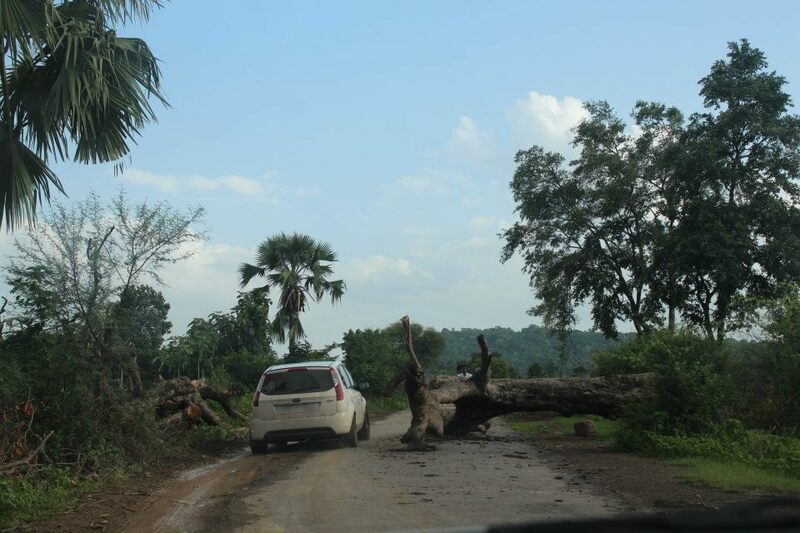 and this tree blocking the road which made our imaginations run wild thinking this was an act of the naxalites to waylay people ! The entire region seemed bountiful with crops and water resources. Through these sights and sounds, we reached Laknavaram Lake. This lake surrounded by hills was discovered during the Kakatiya reign and they expanded it to serve them as a source of irrigation. 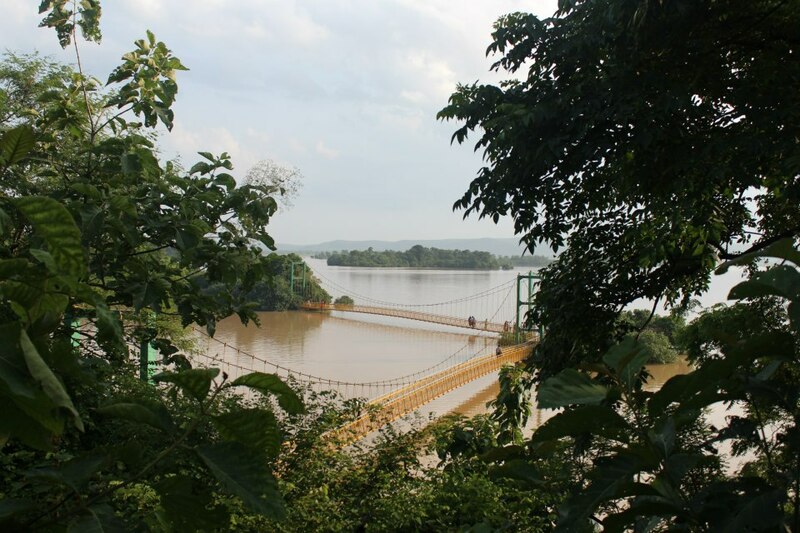 The suspension bridge is an added attraction. The view is awesome ! 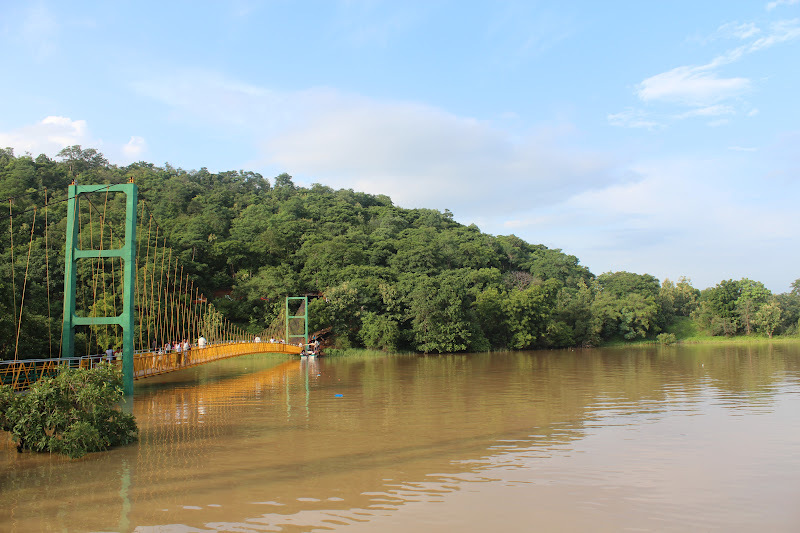 We walked on the hanging bridge which takes to the mini island in the lake. The bridge ends close to the island and one has to wade in knee-deep water to reach the island, fun, if only people didn’t spit in the water. One look at that and we decided not to go into the water ! 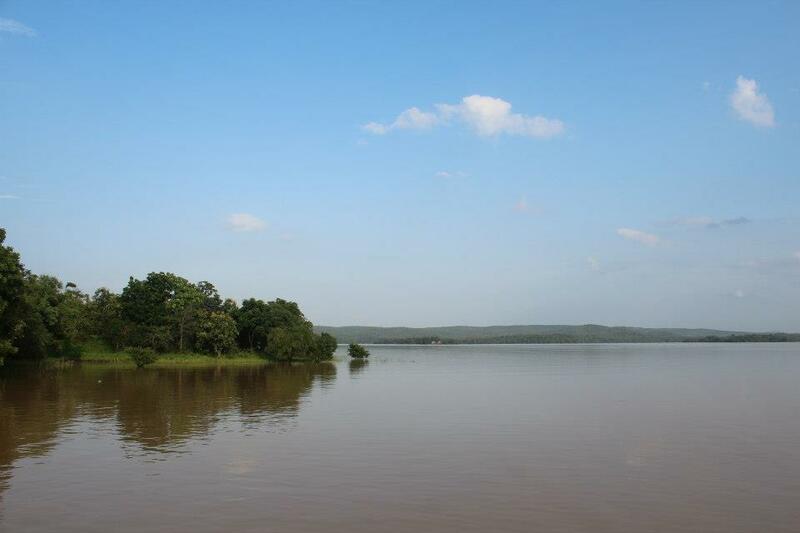 With the heavy rains, the lake was muddy brown with the flood water but even at its dirtiest, nature is a good-looker ! You can go on a boat ride also, it is worth taking the ride as you can get to feel the serenity of the lake. APTDC is building some cottages on the banks of this lake, when completed, it would be a treat to stay here. When we got back from the lake, we asked one of the guards where all this water emptied into, he asked us to walk half a kilometer ahead and see for ourselves. A 10 minute walk along the lake and we heard water roaring somewhere, from the noise one could estimate the immense force of the flow. 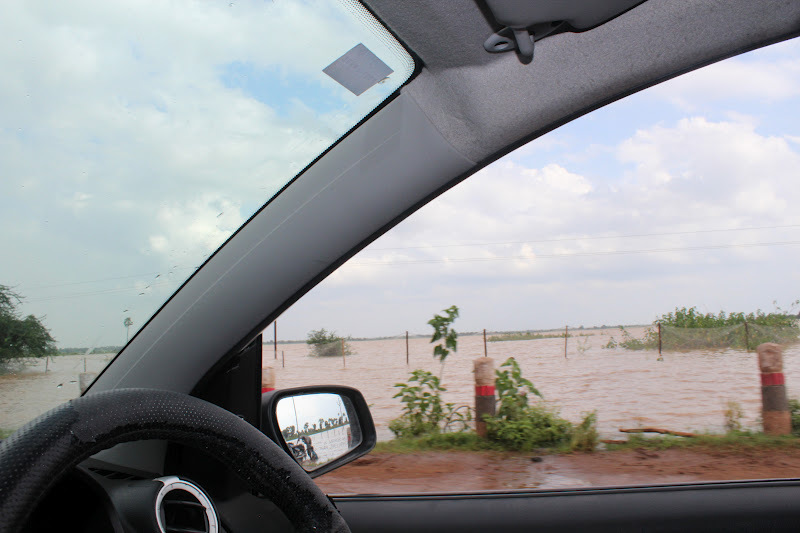 It turned out to be the flood water from the lake overflowing and making a deafening roar as it flooded a connecting road that lay in its path. The force of the flow was scary as we stood on the bank, hardly any of us had seen a flood and water flow with so much force. 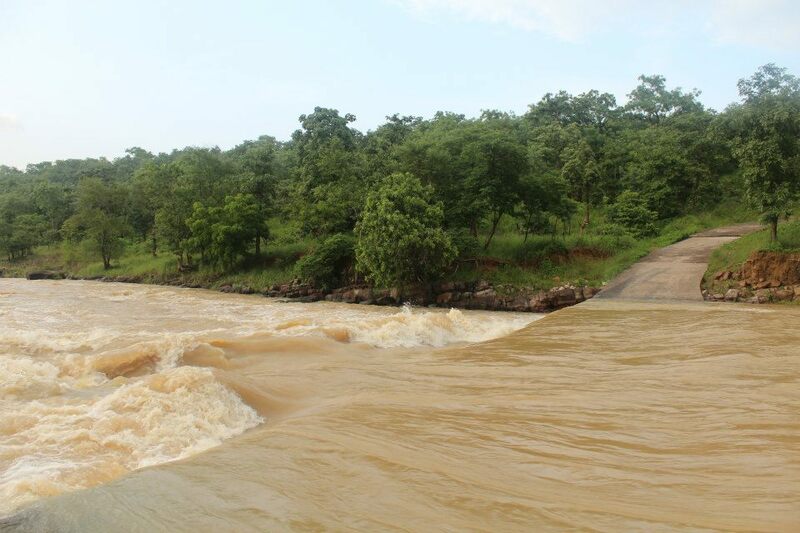 It seems the flood water flows further and meets the River Godavari a short distance from here. This was worth the entire trip to Laknavaram Lake. The sun had set by the time we started back from Lakhnavaram Lake. 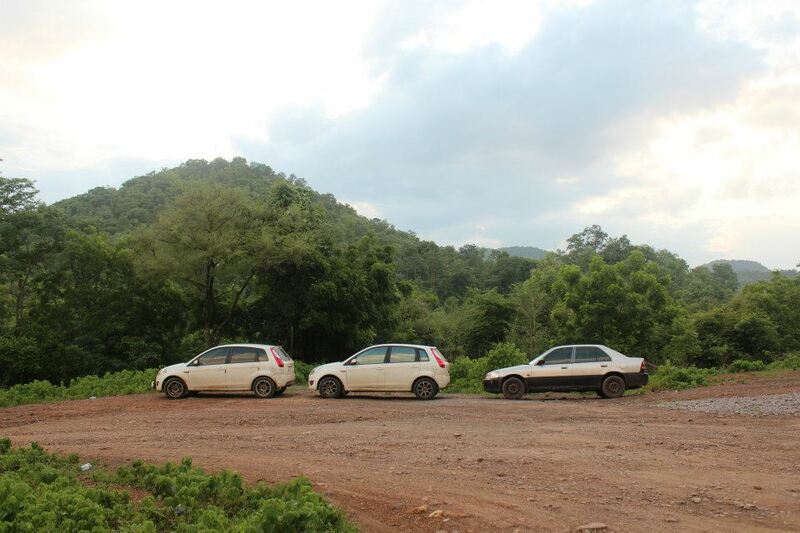 Driving through the mud, slush and heavy rains, our cars looked like warriors returning from a battle. From here Hyderabad was 214 kms. We reached Warangal at 8.30 PM, had dinner at Hotel Ashoka, Meenakshi was in demand again and started back to Hyderabad by 10 PM. The journey back was a breeze and we were home by 1 AM. 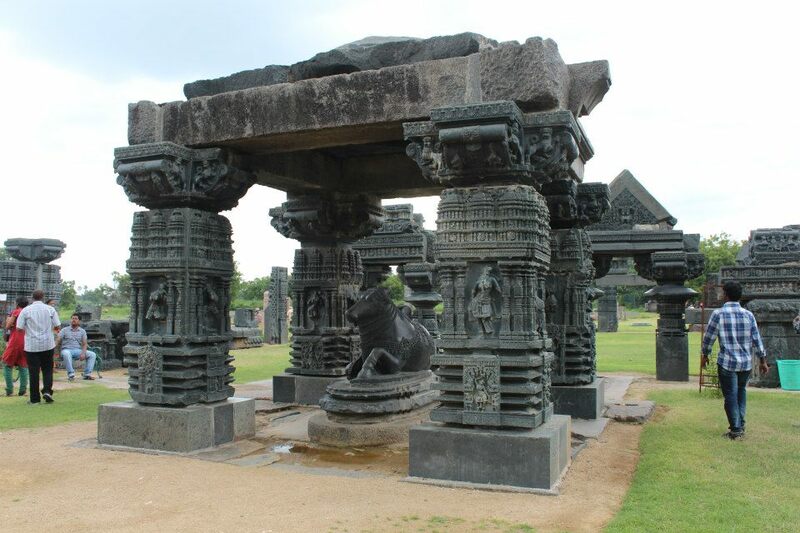 This writer was chanting Warangal’s name for the last three years, badly wanting to visit it and continues to chant its name even after the trip, unable to break from ancient magical charm of the Kakatiyas !